For months Clinton, a former U.S. secretary of state, has held a double-digit percentage lead over Trump, a brash real estate mogul seeking his first elective office. But a spate of national polls in recent days shows the contest virtually even five and a half months ahead of November's national election. Meanwhile, he said Democratic voters have yet to consolidate behind Clinton, who faces a remaining challenger — Vermont Senator Bernie Sanders — before likely clinching the Democratic nomination June 7, when the last key state nominating contests are held. FILE - Supporters of Republican presidential candidate Donald Trump hold up phones and signs at a rally at Radford University in Radford, Virginia, Feb. 29, 2016. In the months-long state-by-state contests against 16 other Republican contenders, Trump won 41 percent of the vote. But The Washington Post-ABC News poll showed Trump is now winning 85 percent support from Republicans in a matchup against Clinton, even as some key Republican figures, including 2012 party nominee Mitt Romney, have refused to endorse him. But Republicans, even if they supported one of Trump's Republican opponents, certainly view him as "the lesser of two evils" compared to Clinton, said Wayne. Galston said he expects Clinton, the country's top diplomat from 2009 to 2013, to get a similar upswing in the polls when she clinches the Democratic presidential nomination, while Wayne says that if July's Democratic national nominating convention is "fairly cooperative" between Clinton and Sanders supporters, "I expect she'll get a bounce and go back in front" of Trump. FILE - Supporters call out as Democratic presidential candidate Hillary Clinton speaks during a campaign event at Carl Hayden Community High School in Phoenix, Arizona, March 21, 2016. Galston added that he suspects "that [Trump] will attack [Clinton] as the candidate of the status quo and she will attack him as a loose cannon, reckless, someone who's too risky to take a chance on. And the people are going to have to make their judgment about their preference for the relative security that Secretary Clinton offers as opposed to the change, but risk, that Mr. Trump represents." U.S. elections, however, are not decided by the popular vote, but rather by the electoral college — with each state's electoral votes determined by its population and the number of senators and representatives it has in Congress. Numerous U.S. analysts, including Wayne, say Clinton holds the edge there, with the U.S. states with the biggest number of electoral votes mostly voting for Democratic presidential candidates over the last six elections. 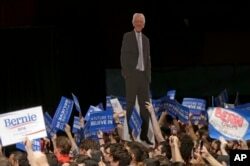 FILE - Supporters display a cardboard cutout of Democratic presidential candidate, Sen. Bernie Sanders, I-Vt., at a campaign rally in Miami, Florida, March 8, 2016. However, said Wayne, "There's a lot we don't know yet" about the election, such as who either candidate will select as a vice-presidential running mate, the outcome of an investigation into Clinton's use of a private email server to handle her messages while she was secretary of state, and voters' reaction to Trump's business bankruptcies and lawsuits against his corporations. For his part, Sanders says Clinton is "jumping the gun a little bit" in considering herself the Democratic nominee. He has acknowledged that he has only a narrow path to overtaking her, but says he expects to do "very well" in the nine remaining nominating contests. "If we win the nomination, I assure you Donald Trump will not become president," Sanders told one rally over the weekend. Sanders called attention to the latest polls that show him defeating Trump by a bigger margin than Clinton — with some even show her trailing Trump. VOA's Jesusemen Oni contributed to this report.